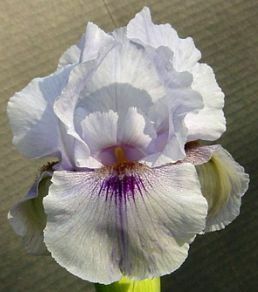 'Desert Diamond' OGB (Ben Hager, R. 1987). Seedling AR41631LvSg. AB, 28" (71 cm). Early bloom. Gray blue white; veined deeper near charcoal beards; deep purple signal. 'Mohr Pretender' X 'Cool Oasis'. Melrose Gardens, 1988.